If you woke up this morning to find your windshield covered in ice, there are some do's and don'ts from AccuWeather to help not only get rid of that ice, but to not ruin your car in the process. AccuWeather says to first start the engine, set the heater to defrost, allow the airflow to recirculate and move the temperature control to maximum. Some cars offer optional electrically-heated windshields that can clear ice very rapidly. If your car has one, use it. AccuWeather says to apply a commercial glass deicer spray to the windshield. These products generally contain methanol, which is the best alcohol for deicing. However, they are expensive, around $15 per quart, and some contain ethylene glycol, which is poisonous to pets. They say to use a plastic scraper, soft bristle brush or squeegee to remove the ice as it melts. Do not use any type of metal scraper, which can scratch and gouge the glass. AccuWeather also says not to use hot water, which can crack the glass by causing thermal shock and will refreeze as it cools. If you want to make your own glass deicer, it involves a mix of isopropyl alcohol (1/3) and water (2/3) in a spray bottle. Isopropyl alcohol ranges from 50 to 90 percent purity. The higher the number the better the deicing capability. Some people suggest adding a few drops of dish soap to the mixture. Others suggest keeping the solution indoors so it will be warmer when used, which helps in melting ice. 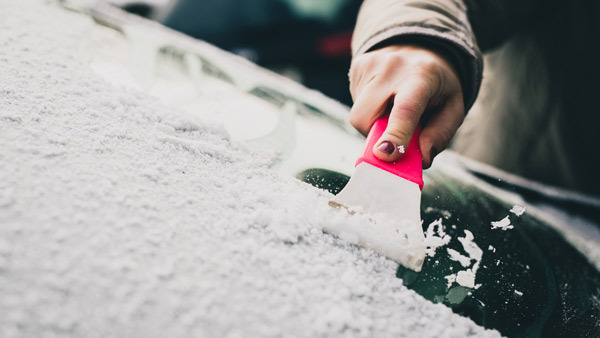 And though the ice already arrived this time, AccuWeather says before the weather turns cold, fill the windshield washer reservoir with a winter fluid or a "de-icer" fluid that will not freeze in colder weather and can aid in ice removal. When freezing weather is expected, AccuWeather says place a piece of wood or other object under the wiper arms to hold the rubber blades off the windshield. This will help to prevent them from freezing to the glass and make snow and ice removal easier.